The sea conjures an elemental dynamic that, in my view, sets Seascape Photography apart from the over-generalisation of 'Landscapes'. For from tempestuous lashings to lapping caresses, the sea’s expressive fluidity is uniquely demanding when successfully interpreting its ever-changing moods with a camera. In the viewfinder, its colours, textures and reflections constantly evolve as the light changes or the weather closes in. Yet show patience. Study and respect the predictable unpredictability. 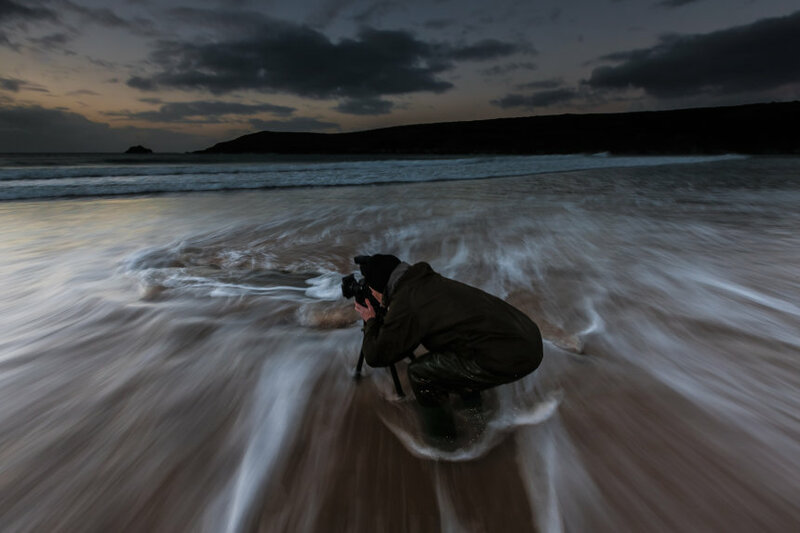 Get your approach, settings and timing right and you can reflect the emotion in the scene that is playing out in front of you and start ‘catching waves’. When going out to shoot a landscape there's the season, time of day, weather and location to consider. If land-locked water is involved - i.e.. lakes and non-tidal streams and rivers, it's fair assumption that its state will remain relatively constant. Yet on the coast, alongside the previously mentioned considerations, you have the added dimensions of the ebb and flow of the tide and the advance and retreat of waves. Not only fundamentally changing the content and composition of a shot, but always keeping the ambient lighting conditions in a state of flux. This constant change demands total respect and attention in terms of personal safety while at the same time presenting a challenging dynamic to set the adrenaline pumping. Then there's the coastal surroundings that offer such a diverse range of locational interest. From vast reflective expanses of sand, serene estuaries and creeks, towering cliffs or rugged, rocky headlands, you can select the surroundings that compliment the sea's state. Add to this the coastal fauna, geology and features and you have a vast textural palette to draw from. Then there's the comprehension that Seascape Photography is governed by two fundamental truths. i) The first is Light; understand the ramifications of how compared to land mass, a large body of water reflects more light. Scudding cloud will mop-up more radiated light yet their undersides will reflect more 'bounced' light to radically change the overall lighting levels (and sea colour), while dawn and dusk 'Golden Hour' levels will rise and fall exponentially. Keep working at your seascapes and pay attention to what's going on around you and in time, an inner-sense will tell you when the light is just right to freeze a wave, catch swirling motion or add ethereal ghosting. ii) The second; accept the fact that the tides will eternally move the goalposts and Seascapes become a challenging and exciting photographic adventure. It's all about understanding and anticipating what could be about to happen. A rolling breaker can add a cornerstone to your composition, yet it’s foaming wake will send your metering see-sawing. You must watch closely and balance the action. For amongst the cacophony of crashing waves and flying spume there will be an order. And just as good surfers 'read' the sea to catch the big break in and use the lulls to paddle out, you can learn to time and prepare for when the big breakers will present impressive rollers and clean lines. Learn to anticipate their arrival and embrace them in your composition. Make the sea work as an integral part of your image. Be pro-active in preparing for a shot but never underestimate its fickle moods. Always know exactly the state of the tide and beware of the big wave that could take you unawares. Check tide tables and refer to Sun, Sea and Weather Apps - I mainly use UK Tides, Sun Seeker, The Photographer's Ephemeris and Magic Seaweed - to make your choice of location. Read the conditions and never over-extend your physical capabilities. Always remain comfortable and in control of your shoot. You will not get good photographs when you are nervous or shooting in a strained posture. Keep safe, warm and dry. I use chest waders to really get into the surf-line action on a beach but I never go too deep, constantly monitor the waves and shift my feet, or knees, to ensure I don't sink too deep into the sand. Likewise I will climb rocks and scale cliffs, but I am slow and methodical in my actions and have had proper training (from the Snowdonia Mountain Rescue team) and wear appropriate gear. Then there's camera approach. It has to be mounted on a tripod. Composed, solidly set in readiness, preferably with a remote trigger. Aside from further reducing camera shake, this frees you to raise your head and scan the scene, spotting the next big set of waves or break of sunshine through the clouds, ensuring you catch the action. I always use Manual setting for camera and lens. Mid-ground focussing with lower ISO and tighter f-Stop will retain crisp detail through the image. Consider ND filters and grads to gain a slightly longer exposure and instil foreground motion while accentuating texture in the sky. Maybe even punctuate an incoming wave with a burst of bounced second-curtain flash to bring the crest to a sparkling full stop in front of the lens. Just a few options from a whole range of techniques that I continually try to expand and extend. For me, the sea engenders a tremendous spirit of freedom that inspires me to constantly evolve my award-winning photographic approach. When it comes to shooting my Seascapes the DSLR cameras are creative tools as much as scientific instruments and they need to be set free and experimented with. That’s why I moved to Crantock on Cornwall’s magnificent Atlantic Coast. Now I am free to roam with my cameras and immerse myself in this vibrant, exciting art form whenever I wish. And it's from my home and studio here that I offer One-to-One, B&B Workshops to DSLR photographers of all levels who want to share in the enjoyment and hone their Seascape skills on some of the UK’s finest coastline. To learn to read the conditions, get the approach right and use Manual settings to capture images ‘in camera’ and then to refine their RAW files through considered use of Photoshop CS post-production.